I’m loving this email posting. Lying in bed, photos on my iPhone, quick and easy, ah it’s the life of a photographer. Took this pic with Markie Stothard and Nickie Rains. How good is that waterfall. Remember the leaches Markie? Hehe having bare feet will attract them. Luckily you had your thongs for part of that 10km hike. ~ by christianfletcher on January 6, 2010. Yes.. very nice waterfall. I have fallen victim to the thongs and leaches combination as well. Great waterfall shot Christian. You should try the WordPress iphone App, free from the iTunes store, even better then email as it give you access to all your categories, etc. damn I have to get an iphone now lol. What`s the details on the image and any work in PS? Thanks Andre for the tip on wordpress for iphone. 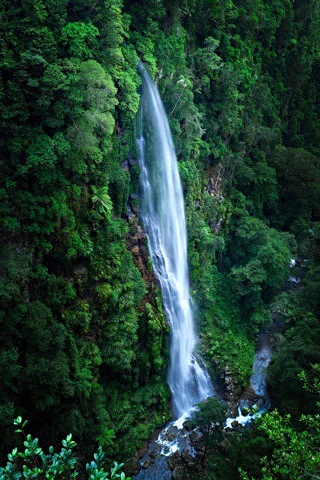 looks like a beautiful place- what a waterfall that is! Are you lying in bed or just telling lies? Sun up in WA yet? Nice one mate…if I remember correctly I carried my things for most of the way! I love this shot, where abouts was it taken? I was down in Dunsbrough on sat morning and thought I would go check out your gallery as I havent been there for ages now. Driving past the little park I notice this black and orange shirt glaring out from the small crowd, Instantly I recognise iTNFP, I gave a quick wave to the man sporting that fine shirt. Either you saw me and blew me off, or you where preocupied by the young ones, I have been telling myself it was the second option for a day now haha. On another note, quite a few new works that I havent seen before up in the gallery, some great photos in there, I have multiple favorites.